Make the helicopter support for your offshore operations easier to manage. Effectively Improving the Efficiency and Safety of Offshore Operations to and from Galliano, Louisiana. Helicopters have more than fifty years in the aid of offshore operations for the oil and gas industry. With missions spanning the globe in areas such as the Gulf of Mexico and all the way to the African coast, it’s no wonder helicopters are seen as a pivotal resource in transporting petroleum products and providing transport services to crews to and from Galliano, Louisiana. While most pilots in the industry have been flying for decades, you would be surprised to learn that more than 50% of these helicopter pilots are veterans of the US military and local government. This gives the pilots we work with the advantage over other operators as having the ability to fly in a vast array of environments and for a multitude of mission types. Safety is our priority and when it comes to transporting your crews, VIPs or supervisors to and from oil platforms as far as 200+ miles out to sea, you can rest assured that your people are safest with our people. All flights are scheduled on-demand which means whether you need a long-term service or for the pilot to fly in IFR or VFR, we can arrange the right person and the right aircraft for the job. In terms of aircraft used in Galliano offshore operations and those onshore in Southern Louisiana, FairLifts can provide you with several options. Although most crew transports are carried out in smaller aircraft such as Bell 407’s or 206’s, we can arrange for product transport, cargo lifts, and repair components to be carried out in medium or larger aircraft including Sikorsky S-76’s or S-61’s. This option, we can offer you in an effort to keep any mission you have in mind cost effective, efficient and in the most capable aircraft available. While there are multiple ports, the largest and most often referenced is the Louisiana Offshore Oil Port (LOOP). For more than three decades the port has handled more than 12 billion barrels of foreign and domestic crude oil for the world’s largest consumer of petroleum products, the US. The United States relies on a constant supply of petroleum products meaning business in the offshore oil industry can never be allowed to slow. This has been the case since the early 1900’s when Texaco began drilling on Lake Pelto. Since, Louisiana has grown to have reserves of 458 million barrels of oil (excluding federal offshore areas), 2.1 percent of the nation’s total, and 10 billion cubic feet of natural gas, 4.2 percent of the U.S. total. With business being what it is in the Gulf of Mexico, a near 25% of all domestic oil production, it is no wonder the use of helicopters is needed. Transporting oil products, machinery and parts as well as crews is an on-demand service and must be handled by a professional and experienced pilot. Which is why FairLifts works with nothing less to provide you with efficient, precise and safe offshore helicopter operations in Galliano, Louisiana. Deepwater rigs are those located far off the coast providing untouched resource veins to companies all over the world. As most of these are located hundreds of miles off the coast, there are few options when it comes to delivering your crew back and forth for shift changes and specialized work. You could choose to send them on another water vessel but that could take them a long time to get there along with the logistical headache it is in trying to get one of these to leave sooner rather than later. With helicopters, your crew can be out to the platform in a matter of a few minutes to an hour and a return flight with the previous crew can be arranged easily as well. Offshore crew transport is the predominant service offered by helicopters to those working on platforms and ships. With flexible scheduling, on-demand and last minute flights available and the use of the aircraft to ferry workers long or short term, the best and safest way to get your crew to and from the offshore base is by way of a helicopter scheduled through FairLifts. Galliano offshore operations are conducted all year and with that can come the occasional need for a part to be replaced or renovations to be made. Heavy lift helicopters can be arranged to deliver parts immediately directly to base so you can avoid losing product, leaks or delays in productivity. Save money when you charter an ondemand cargo flight to retrieve and transport parts or for the installation of large components. 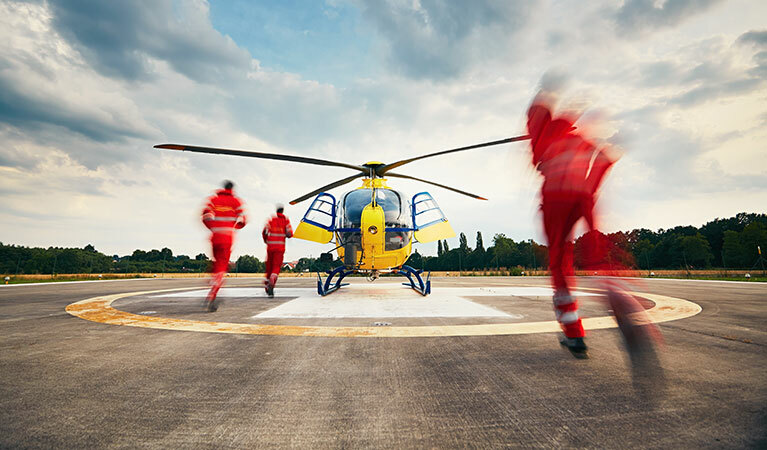 Your crew works in an environment that can be hard to predict and as that is the case, we offer the urgent go-now solution for crew assistance in search and rescues, emergency shuttles to and from hospital facilities and evacuations. In the event of an emergency situation, helicopters can be dispatched in a matter of minutes and be on the way as soon as called. Don’t trust your crew’s health with an unreliable operator when you can put your trust in FairLifts. Often, we get calls from owners needing to schedule flights out to rigs, bases and remote structures for potential buyers, partners, clients and VIPs needing to examine their investments. Point to point and round trip shuttles are easy to schedule and can be conducted in luxury helicopters specifically utilized for tours or base inspections. When it comes to onshore operations, FairLifts is also a comprehensive solution. If you need to schedule recurring surveys to detect anomalies within your pipeline installations, need to transport crew to remote facilities or would like a helicopter to deliver pipe components to a construction zone, we can arrange a tailored solution for you. Your offshore operations from Galliano, Louisiana can be more efficient! Our agents and affiliated operators have both worked with large corporations and smaller oil companies for many years and as experienced individuals in the industry we are prepared to organize your helicopter missions down to the last detail. Consultations with a specialist are free as well as your complimentary quote. Simply call us seven days a week to discuss your mission or project specifics and we will find the most cost-effective and efficient solution for you.